When I heard a few years ago that colleague Judy Jenner, who lives in Nevada (USA) had begun teaching courses at a California university, I pitied her for the commute. Then I heard that it was all done online, and while I remember some good programming courses I took that way ages ago, I was curious how this would apply to translation and interpreting. Since then I have met other professionals bringing their experience to university education this way and seen excellent online education in the Portuguese university system, so when Judy a few days ago that she would be offering two courses again this spring, I asked to see her syllabus to get a better understanding of her approach to education. That led to more questions... and answers. (KSL) Judy, thank you for sharing the syllabi for your two courses offered this term through UC San Diego Extension. I have a great personal interest in how effective distance education is conducted, and the syllabus organization makes it clear that these are structured courses with clear objectives for those interested in Spanish/English language service careers. Could you tell me how you became involved with the UCSD Extension program? (JJ) My pleasure. The university’s Extension program contacted me a few years ago and asked me to serve on their advisory committee for the certificate in English/Spanish translation and interpretation. I gladly accepted and helped them shape their program a bit. Following that pro bono work, the university asked me to teach a class. I was initially a bit hesitant, as I really enjoy giving one-day workshops for fellow professionals, but wasn’t sure about teaching beginners. However, I immediately fell in love with teaching and have gradually added two more classes. The positive feedback from students has been overwhelming, and I really enjoy helping educate the next generation of translators and interpreters. (KSL) What is the typical profile of a student in your course? For whom would these courses not be suited? Do you have students outside the US? (JJ) Anecdotally, I’d say that the vast majority of my students already have a bachelor’s degree and many hold a graduate degree as well. I’ve had many students looking for a career change and others who are young and looking for an education in T&I from a well-known university. I’ve even had a college professor of Spanish take my class, and he really enjoyed it. I also get many heritage Spanish speakers. These students are first-generation Americans with Hispanic parents who grew up in the US and spoke Spanish at home but have no formal education in Spanish. Many students do think that being bilingual means that they are automatically a translator or interpreter, and I go to great lengths to clear up that misconception (and many others). Some students have called my class “reality check,” and I think that describes it well. It’s my job to tell students about the realities of our profession without sugar-coating anything, and if a student finishes my class thinking she’s not yet qualified to sell her language services, then I think that’s also a perfectly good outcome. I think it’s crucial to prepare students for the realities of the marketplace, which T&I programs have traditionally not done. I also do have a lot of students from outside the US, including Spain, Bolivia, Argentina, Italy, Switzerland, etc. I love reading about my students’ lives and their adventures. I have a student who is currently teaching English in Russia. (KSL) The syllabi mention the "Blackboard" system? What is this exactly? Are you familiar with other course management systems, and if so, how do these compare? Are your lectures live or recorded, and how are assignments handled? (JJ) Blackboard is a powerful online learning system that’s widely used by leading universities around the world. It’s entirely web-based and houses all the lectures, discussion groups, grades and exams and quizzes. I’ve worked with other online learning systems, and I think Blackboard is probably the best system, as it is quite intuitive and user-friendly. However, just like every piece of software, it has some flaws. The lectures consist of pre-recorded PowerPoint presentations with audio that include exercises, lots of graphics and pictures, etc. Students have weekly deadlines that they must meet, and everything is handled through the Blackboard system. (KSL) Are these courses part of a degree or certificate program? What other related offerings does UCSD Extension have? (JJ) Yes, these courses are part of the online certificate in translation/interpretation. There are two certifications: one for translation (http://extension.ucsd.edu/programs/index.cfm?vAction=certDetail&vCertificateID=174) and one for translation and interpretation (http://extension.ucsd.edu/programs/index.cfm?vAction=certDetail&vCertificateID=83) Most of the classes, if not all of them, are offered online. Other classes are held at the La Jolla campus (which is quite gorgeous). However, students can just take individual classes as they wish and don’t necessarily have to work towards the certificate. (KSL) What are the advantages and disadvantages you find in this type of instruction? Do you feel there are particularly important aspects in organizing such a course successfully? (JJ) Here in the US, it’s quite a challenge to get a university education in translation and interpreting, which certainly isn’t the case in Europe. However, in recent years, many universities have started online programs, which helps fill a void. While these are not full degree programs, at least these are certificate programs that teach students the basics. The more people we can educate about our industry and its challenges and rewards, the better. However, I’d like to point out that I think it’s essential to look for a good university – preferably a bricks-and-mortar university that has added an online component rather than an online-only program, as the quality of instruction at some of these programs can be sub-par at best. Online instruction removes the geographical barrier and lets students do the work on their schedule. I really don’t think my translation students are missing out on anything they would get in a traditional classroom. I still answer questions in a very timely fashion, interact with students on a daily basis, and grade all their work. For the interpretation class, I think online education might be a bit better because few universities in the US have the simultaneous interpreting labs that are needed to properly practice simultaneous interpretation. Without these labs – and I have been to many workshops and classes where we have had to do this – the instructor just plays an audio file and all students interpret at the same time and record their performances using their iPhone (or similar). This is obviously not ideal as it gets quite noisy. With the online interpreting exercises, I read dozens of prepared speeches every class and students get to interpret them at home with a headset in a quiet environment. They can interpret the same files over and over and get practice that way. Of course they don’t get immediate feedback because I am not there with them, but in my experience, even when I attend week-long training sessions (I went to the highly regarded Monterey Institute of International Studies last year), you also get limited feedback, as class sizes tend to be large. Of course there are drawbacks as well because there’s nothing quite like meeting students in person. Luckily, I have met many of them at conferences, which is lovely. Unfortunately, I usually do not write letters of recommendation – I feel like I really need to spend time with someone before I can recommend them for graduate school, a job, etc. (KSL) What is the deadline to sign up for your next courses? (JJ) Introduction to Translation (five weeks) starts again on April 1, and you can sign up until April 1, although the class does tend to fill up. Introduction to Interpretation starts on May 6, and my brand-new class, Branding and Marketing for Translators and Interpreters, starts April 1 as well. An indexed, recorded course lecture in the Blackboard environment. A lot easier to follow than typical "webinar" formats. Judy Jenner is a court-certified interpreter (Spanish and German) and legal and business translator in Las Vegas, NV. She runs Twin Translations with her twin sister, Dagmar. They are the authors of the industry book “The Entrepreneurial Linguist: The Business-School Approach to Freelance Translation,” which has sold more than 3,000 copies and is required reading at universities around the world. Judy pens the monthly Entrepreneurial Linguist column for the American Translators Association’s Chronicle and is a regular contributor to the Institute of Translation and Interpreting’s Bulletin. Judy was born in Austria, grew up in Mexico City and has lived in the US since she was a teenager. She is the immediate past president of the Nevada Interpreters and Translators Association and a frequent keynote speaker at conferences and workshops in many countries, including Brazil, Ireland, UK, Austria, Germany, etc. 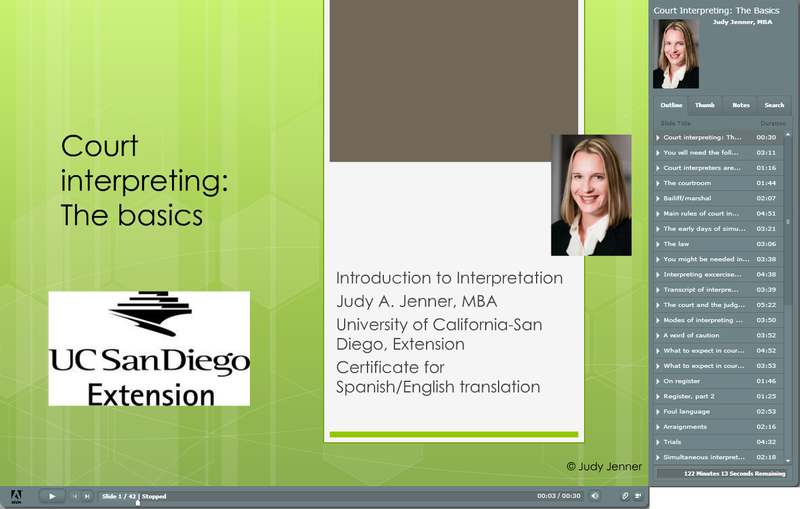 In addition to her translation and interpreting work, Judy is an adjunct in the online program of the University of San Diego-Extension’s online certificate in translation and interpretation. She blogs at www.translationtimes.com and she’s on Twitter (@language_news). Many thanks for posting this, Kevin! We really appreciate it.